Black diamonds of various sizes yield like a perfect crystalline structure to a densely crowded surface. Five rings make up the series of Massive Champagne. Black Diamonds meet black metal. Niellium is the material medium for the precious stones set in pavé and draws attention to itself as well. The stones do not fill the entire ring, instead they are concentrated in asymmetrical, demarcated sections, whose form and extent vary from ring to ring, imparting a further dimension to each one. As restrained and refined as the collection appears at first glance, the objects become all the more seductive upon closer inspection. The dark, shimmering areas fool the eye with illusory parallels and perspectives. The singular diamonds merge with the whole and appear again as a fleeting phenomenon, like drops of dew in the moonlight. Tiny bubbles float to the surface in champagne which distinguishes it from other sparkling wines. The bubbles of the wine are like sparkling jewels, a symbol that serve as an inspiration. The name “Massive Champagne” draws on this metaphor that flows from the drink to the art of goldsmithing. 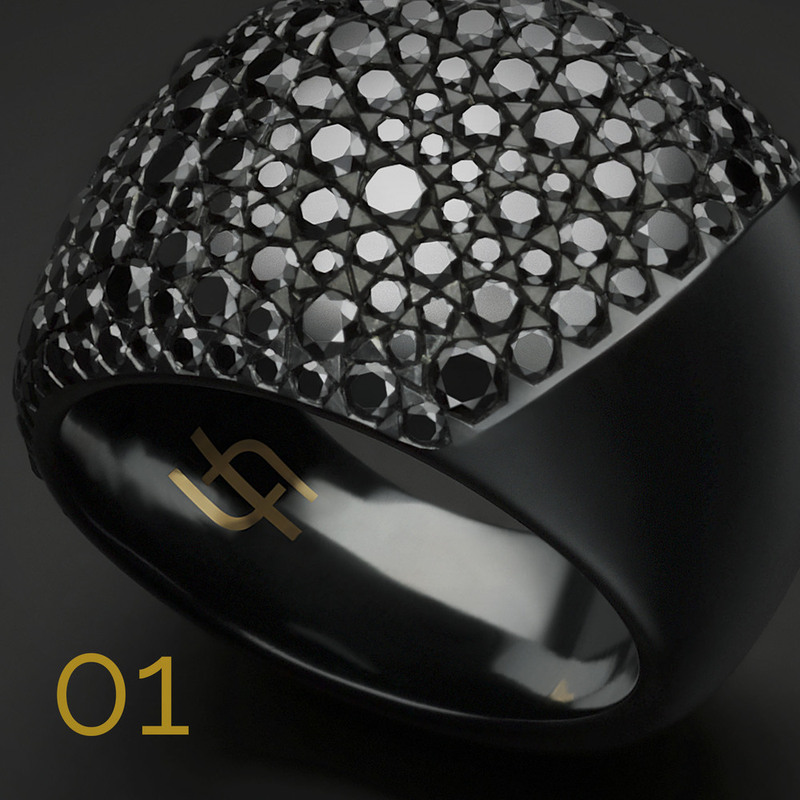 The reflexes of the black rings are intertwined with glamour and celebration.